A small home theater PC (HTPC) driven by an Intel Atom is not a new idea. Both NVIDIA’s ION and Broadcom’s Crystal HD offered solutions that coupled the chip’s TDP with specialized hardware that overcame its shortcomings–one with a complete GPU, the other providing just hardware accelerated video decoding. Neither of these products truly delivered on the concept of a quiet, low power HTPC that just works without undue compromise in many areas. To be fair, some of the blame clearly belonged to Intel because the CPU in yesterday’s Atom was slow and the GPU inadequate. Fortunately increased competition at the low end of the market and the shift towards mobile has provided the necessary impetus to address both of these deficiencies, with modern “Bay Trail” system on a chip (SoC) offering significantly improved CPU performance alongside a much more capable GPU, so much so that the integrated processor graphics (IPG) powering the Intel NUC DN2820FYKH comes to us today wearing Intel’s budget desktop moniker “Celeron” instead of “Atom”. Marketing labels aside, if the $139 system can deliver the perfect low power small form factor (SFF) HTPC, “steal” would be the best way to describe it. The Intel NUC DN2820FYKH’s packaging is very retail friendly, but lacks the gimmicky-but-still-somewhat-cool Intel chime found on other NUCs. A 12V power adapter, with global receptacle support, and VESA mounting bracket are included alongside the Atom (Bay Trail) powered system. As a barebones system you will need to provide a SO-DIMM of 1.35V DDR-3L, storage and the OS to actually use it. From the outside, there are a several cues of the DN2820FYKH more budget oriented targeting versus its Intel Core based siblings–most notable fewer USB 3.0 ports (only one) and the absence of DisplayPort. Otherwise the chassis is mostly identical: same one piece aluminum wrap around and black piano gloss top, with excellent fit-and-finish. Also present, a built in Windows Media Center compatible (RC-6) Consumer Infrared (CIR) receiver. While the CIR itself is not the same–it is sourced from ITE instead of Nuvoton–the functionality is mostly the same, with the DN2820FYKH supporting power on from standby/hibernate/soft-off (S3/S4/S5), but it does not provide the discrete power commands so programming startup macros is much more challenging. The only storage option is provided by the 7mm/9.5mm 2.5” bracket, so you are limited to one drive. Neither of these trade-offs is inconsistent with the budget market targeted by the DN2830FYKH though, so it is difficult to judge them harshly. 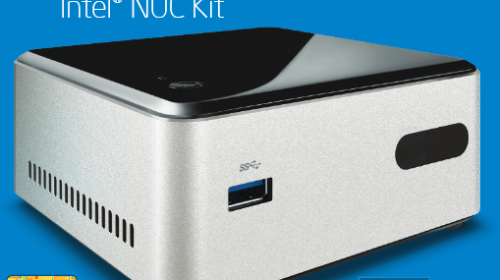 Where the Intel NUC DN2820FYKH’s externals only hint at the budget target audience, on the inside it is pretty clear. Only one SO-DIMM slot is provided, even though the Intel Celeron N2820 supports two memory channels, mSATA is not an option, and the internal USB/front panel headers found on the D54250WYB did not make the cut. Cost was also curtailed from hardwired Ethernet, with a Realtek 8111GN-CG doing the heavy lifting instead of the more capable Intel hardware found on most of their motherboards. Strangely 802.11N wireless and Bluetooth is provided out of the box via an Intel 7260BN mini-PCIe card. I would much rather have had a better Gigabit solution and no Wi-Fi, even with Intel pocketing the difference in BOM. After all, I can always add wireless if necessary, but it is not possible swap out the integrated Ethernet. 1x SO-DIMM DDR3L (DDR3 1.35V) 1066 / 1333 / 1600 (1066MHz actual clock) MHz 8GB Max. Having some experience with Intel Atom and AMD Zacate based systems in the past, the most surprising thing about the Intel NUC DN2820FYKH was the performance – it doesn’t feel slow. This is especially true in Windows 8.1 where both Metro (expected) and the desktop (not expected) experiences were quite responsive. The same was true in OpenELEC and [to a slightly lesser extent] Mint. Now there clearly are still noticeable differences between the N2820 and a modern Intel Core based IPG, but for general purpose computing (web browsing, word processing, etc. ), it just did not feel like a hard compromise the way it has with the previous generations of these types of systems. The BIOS is modern and straight forward. As a budget system there really is not much to tweak unless opting for Windows 8+, you will need to check the boxes to enable secure boot and install the necessary keys. When I first looked over the specifications for the Intel Celeron N2820 powering the DN2820FYKH I was disappointed with the limitations placed on the system, because according to the product page there are a lot of features that Bay Trail supports that were not included in this incarnation, like Quick Sync (hardware accelerated transcode), InTru 3D (Blu-ray 3D and HD audio bit streaming), and Clear Video HD (hardware accelerated HD video decode and processing). Having spent time with the system, the reality of the features is much more ideal; for the most part each of the missing items are actually present to some extent. 3D Blu-ray works, hardware HD video decoding works, even Quick Sync [sort of] works. Bizarrely however, despite the “No” to the InTru 3D question on ARK, platform level support is documented on page 21 of the technical documentation and HD audio bit streaming works on Linux. It does not on Window though, most likely as an artifact of how Intel structures protected audio playback on the OS, where the Management Engine (ME) is required, but unfortunately the driver will not install. The limitation is mostly academic because multi-channel PCM over HDMI is supported, so HBR formats can be decoded on the PC and sent over the wire with no loss in fidelity. It is frustrating nonetheless because the hardware is clearly capable, just artificially/unfortunately limited in some environments. As you would expect from a system with an Intel Atom based IPG, electricity consumption is an area of strength. With the maximum power consumption of 9.9W and 4.4W idle it certainly delivers on low power; what was unexpected however, is that even when running Prime95 it is almost completely silent. 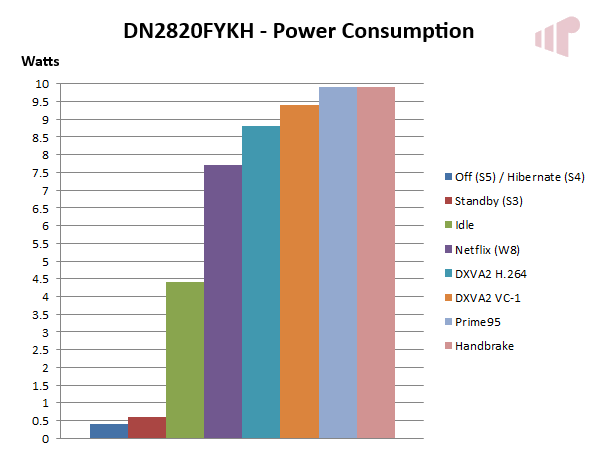 Of course low power consumption does not mean much for a HTPC, if the system is not capable of providing a decent viewing experience — which for the most part the Intel NUC DN2820FYKH is. Standard DXVA2 interfaces are used for hardware accelerated decoding on Windows, so support from retail and free products is good. The Intel Media SDK is also supported so older players that rely directly on it, instead of DXVA2 will also work, but the well known “Intel QuickSync” decoder available in LAV Filters and Ffdshow will not because (like DXVA-Copy Back) it requires that the decoded frames be copied back from GPU memory to system memory and the single channel of 1066MHz memory and low-end CPU is not up to the task (note the dramatic difference in CPU utilization between DXVA and DXVA-Copy Back) with both methods producing unacceptable results. Not that it matters much because the Intel Celeron N2820’s GPU cannot adequately meet madVR’s processing demands and it works very well with the Enhanced Video Renderer (EVR). Video levels are correct, blacker-than-black (BTW) / whiter-than-white(WTW) are clipped by default, but can be enabled. There is even an option for full-range output over HDMI in the video driver now. 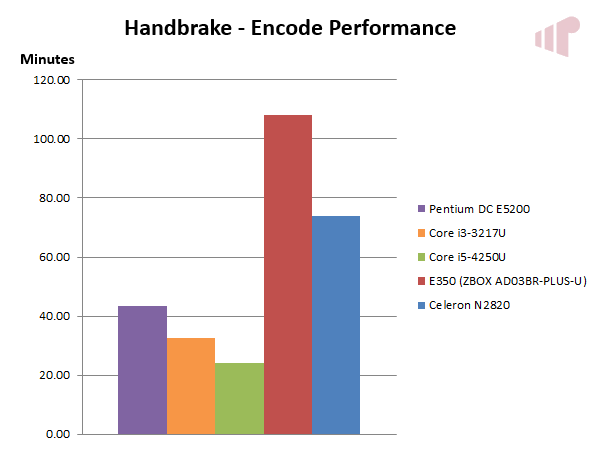 Support for video processing features like advanced deinterlacing, cadence detection, and noise reduction are also present (using the same IMFVideoProcessor GUID as Intel Core IPG) so the concerns that I expressed previously can be mostly ignored. However 4K content will not play properly, even though hardware support is present, either due to the resources (93.42% GPU utilization) required to downscale and render at 1080p (I do not have a 4K display to test native playback) or because it does not have the necessary memory bandwidth. Software decoding is adequate for many types of content, but ultimately the CPU is underpowered when attempting to playback high-bitrate Blu-ray quality files so it cannot be relied on for problem free viewing. Switching to XBMC on Linux Mint and OpenELEC, the general story is the same: when leveraging hardware accelerated video decoding playback was good (also excluding 4K), but when decoding in software it was not reliable for high bit-rate HD files. Oddly XBMC did not select hardware acceleration in cases where it should have (e.g. H.264 in M2TS and VC-1) so the “will it work” question is not as straightforward as it should be. Also, it is worth mentioning again that HD audio codecs will bit stream on Linux, where they do not on Windows. 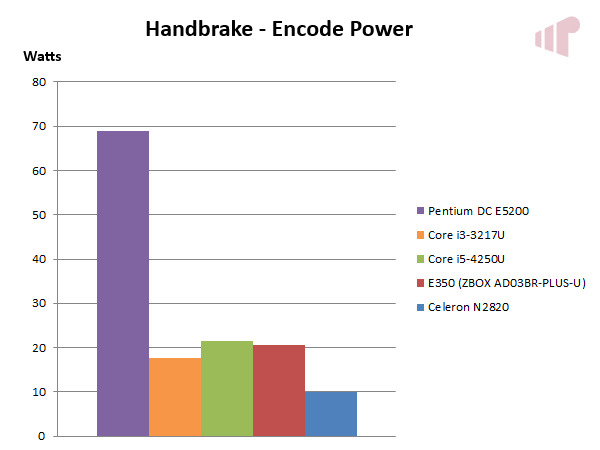 Looking at Handbrake as a way to measure relative CPU performance, we can see that while the Intel Celeron N2820 out performs the AMD Zacate based E350, it lags all of the other desktop-class CPUs including the ancient Intel “Wolfdale” Pentium DC E5200. Naturally, it mops the floor with the group when it comes to power consumption though so it is quite clear where the trade-off lies with this platform. As was mentioned earlier, Quick Sync works on the Intel Celeron N2820 – though not officially; even though hardware encode and decode support is included in the platform documentation. Pretty muddled, and this is exactly what was found during the time spent with the device. 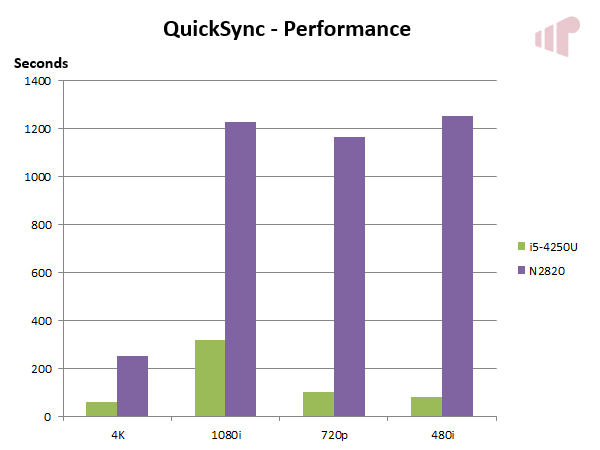 Early drivers claimed support for Intel Quick Sync (the marketing name for the features provided by the Media SDK API) transcoding, but results were mixed when trying to use it. QSTranscode worked but retail utilities like ArcSoft’s Media Converter 7 (MC7) would hang when trying to use it. This changed with the most recent driver (3408) where oddly the Meda SDK analyzer stopped reporting encode support, but MC7 now works. Either way, Quick Sync support here does not deliver the same experience that we have come to expect from the technology (probably why it is not an official-official feature). Apps that use it will spin up the CPU, and it does not deliver the enormous performance gains versus software here that it does on Intel Core IPG. In real terms, if targeting a small screen mobile device it can transcode faster than real time (4K file is five minutes and 30 seconds and the others are roughly 30 minutes each), but nowhere near as quick as what we have come to expect from other Intel Quick Sync enabled systems. With Intel Core graphics long suffering lack of refresh rate precision just fixed with Haswell, checking the Intel Celeron N2820 was one of the first TODOs added to the list. Happily, performance in this area was excellent, but sadly the GPU lacks the grunt to really use the renderer used to capture it (madVR). Ultimately, I have a really hard time finding significant faults with the Intel NUC DN2820FYKH. It delivers on many of the points where previous attempts have failed. It is a quiet, low powered and competent SFF HTPC if the CPU’s limitations are tolerable, but you should not buy one for one simple reason: this $139 DN2820FYKH is being replaced by the [probably] $139 DN2830FYKH – which as you should be able to guess is based on the faster (2.16-2.41GHz) Intel Celeron N2830 which also supports faster (DDR3L-1333) RAM and has official Intel Quick Sync support. So if this system meets your needs, wait a bit and get that one instead. Thanks to Intel for providing the review sample.